Roughly 18 months after a chunk of ceiling fell at a popular Chicago nightclub, city inspectors say the venue is safe for concert goers. But a structural engineer cautions against a quick fix, and two teachers, despite assurances from the city, still feel traumatized by what happened. School teachers Brenda Jimenez and Rosie Saldivar attended a September 2011 concert at the Aragon Entertainment Center when a piece of the ceiling rained down on them. "My friend says, 'Did you feel that?' And I’m saying, "Yes, what is it?' And we both said, 'Oh my God, it’s the ceiling. It’s coming from the ceiling,'" Saldivar recalled. She said she remembered Jimenez suddenly grab her hand. "When I looked at her, she was already covered in blood. I mean lots of blood," said Saldivar. "Part of her skull was like literally sticking out. Her hair was hanging." Jimenez was rushed to a hospital where doctors needed eight staples and 30 stitches to close the wound. A year and a half later, Jimenez says her lawyer is still trying to get the Aragon to pay her medical bills and it’s unclear if the Aragon ever repaired or even inspected the ceiling. Several attempts to reach Aragon officials resulted in a manager saying only, "No comment." 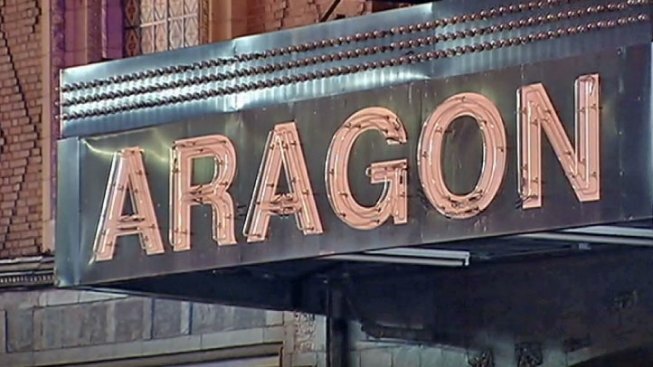 NBC Chicago last month paid a visit to the Aragon. Inside, our camera recorded what looked like a hole above the place where Jimenez and Saldivar said they were standing. Allan Gold of AHG Structural Engineering said that if a ceiling fails, it’s a warning sign about other parts of the ceiling. He also added that building owners have a responsibility to fix it immediately. "Once you have danger warnings you need to schedule an inspection with a qualified engineering firm or architectural firm and erect scaffolding and get up close to the ceiling and examine it inch by inch," said Gold. Five years prior to Jimenez getting injured, in 2006, the city cited the Aragon for "failing to maintain ceiling free of chipped or loose paint, plaster or structural material." The venue, however passed subsequent inspections, including one in the months before and after the accident. Still, Saldivar said she won't be returning to the Aragon. "This is a time bomb that is waiting," she said. "I feel the city needs to do something before it happens." The city has take action. After NBC Chicago reported the accident to the building department, they sent an inspector to check the ceiling. According to Susan Massel, spokesperson for the city’s Department of Buildings, the inspector found the building safe for concert goers. Massel added that the city is also in the process of notifying the Aragon about the results of its recent inspections and will take appropriate enforcement action in the weeks ahead. Ten years ago, on February 17, 2003, Chicago experienced one of the worst nightclub disasters. Twenty-one people were killed at the E2 nightclub on Chicago’s near south side when panic set in after security guards used pepper spray to break up a fight. During the aftermath, city officials vowed to step their monitoring of the city’s 3,000 Public Places of Amusements (PPA’s) that serve alcohol. Paul Wertheimer is the founder and head of Crowd Management Strategies, a Los Angeles-based international crowd safety consulting service with a specialty in concert and festival safety issues.